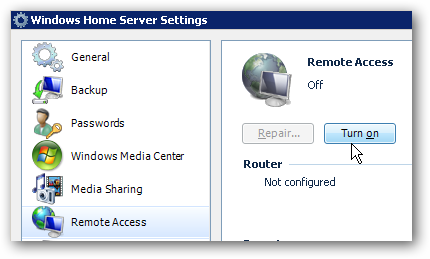 One of the cool things about Windows Home server is the ability to access files remotely. Here we look at basic access to data while on the go from your iPhone or iPod Touch without installing additional apps. 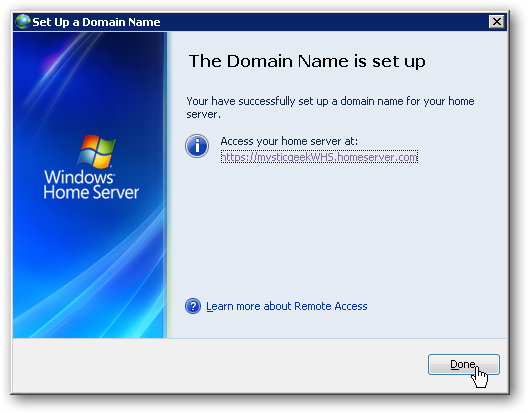 After you setup Remote Access on your Windows Home Server, you’ll be able to access its shared files and folders from virtually anywhere. For this article we’re accessing WHS from an iPod Touch running iOS 4.0, but you can access it from any smart phone, tablet, Android device, computer…essentially any device with Internet access. 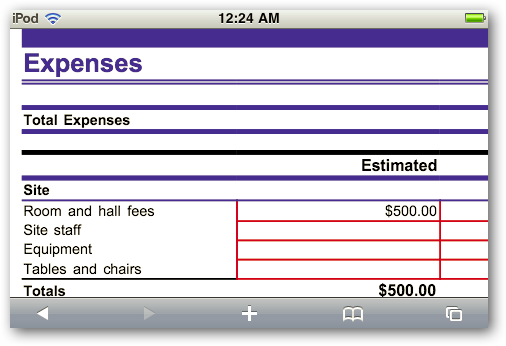 The server we are using is a home built machine, and we’ll look at getting basic access to your documents through the Safari browser. Note: This will allow you basic access to files, folders, and documents out of the box without installing any extra software on your Home Server or iPhone or iPod Touch. 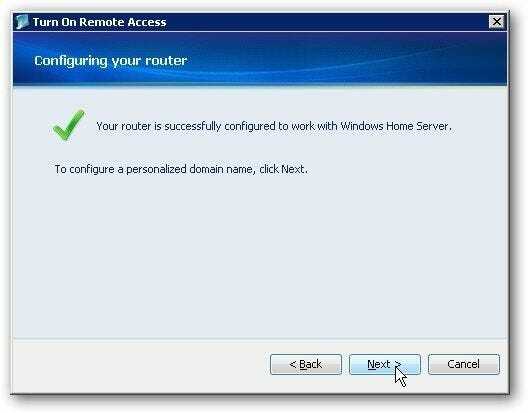 If you haven’t done so already, you’ll need to set up Remote Access on your Windows Home Server. 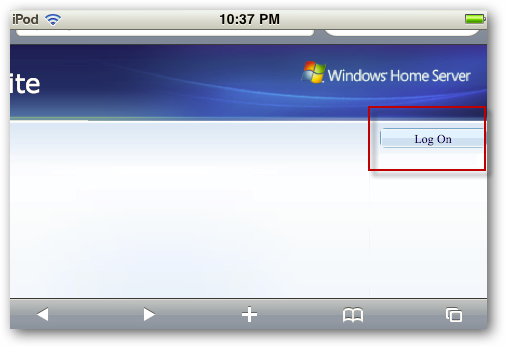 Open Settings and select Remote Access and Turn on. The Remote Access wizard starts up for you to easily get started. 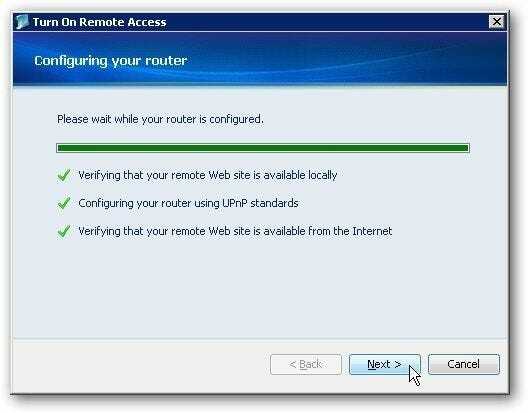 It verifies your remote web site is available and configures your router using UPnP standards. After that you’ll get a message verifying it was configured successfully. 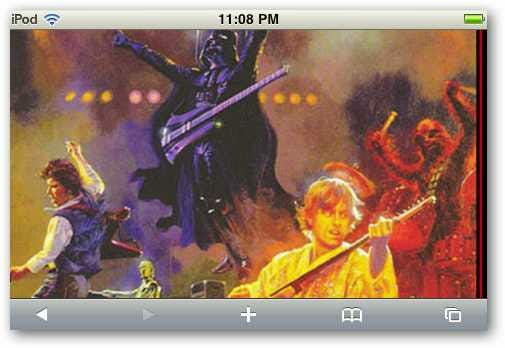 Then choose a name for your Domain and finish out the Wizard. 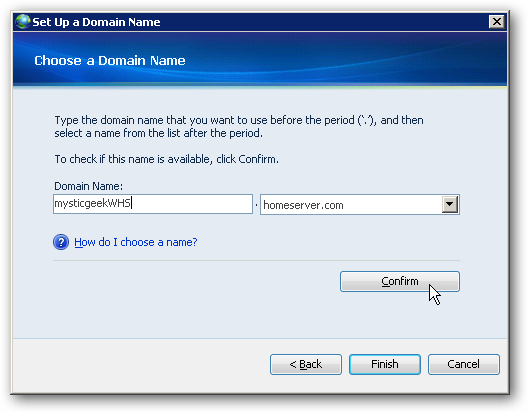 After it’s set up from the Settings menu under Domain Name, click on the Details Button. 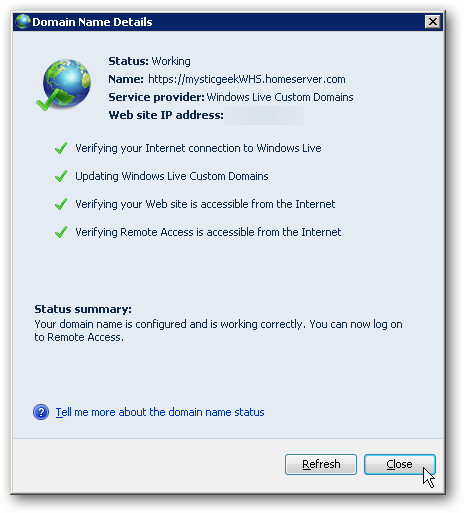 Then refresh your domain information to verify everything is working correctly. 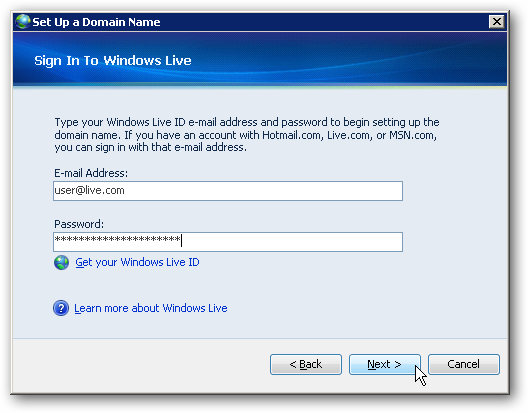 For a full tutorial check out our article on how to setup remote access in WHS. Now that we have Remote Access and our Domain configured, we’ll be able to access it from anywhere we have an internet connection. Again, here we’re using an iPod Touch, but you can access it from any computer or smart device like an iPhone, Droid, or any portable device that is Internet capable. 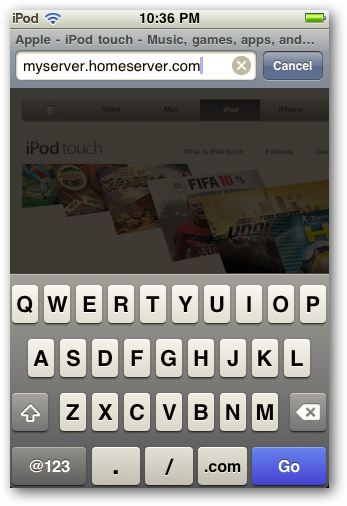 Open the browser from the main menu on your iPod Touch…here we’re using Safari. 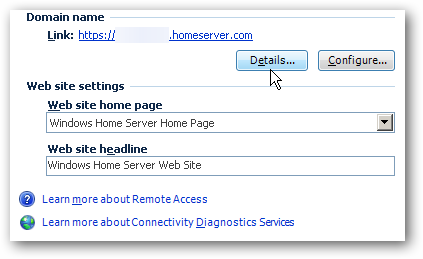 Now type in the web address to your Home Server you created while enabling Remote Access in the steps above. 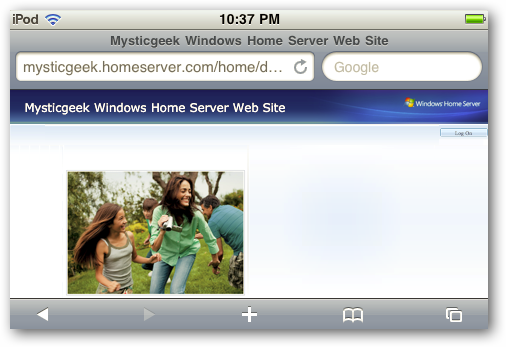 You’re brought to your Home Server site and you’ll need to login. 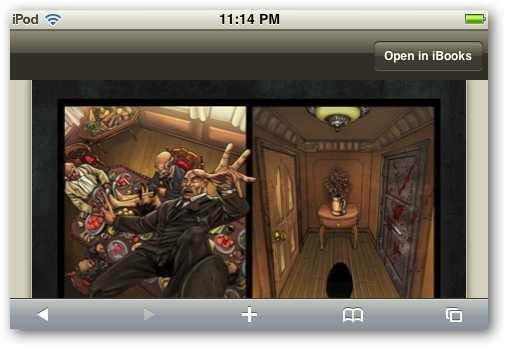 Tap the Log On button located on the upper right corner of the page. Enter in your user name and password. 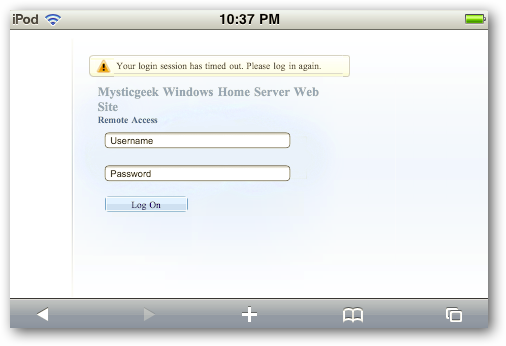 Keep in mind due to security restrictions, you can’t login as Administrator. 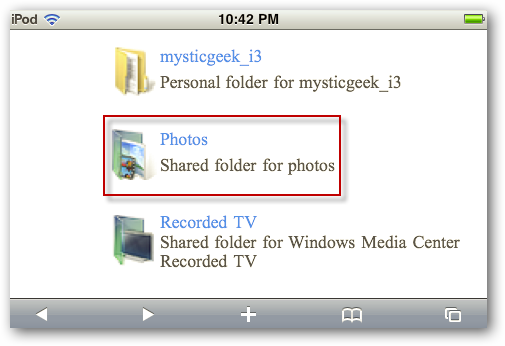 Now you can access your shared folders from your Server on your device. Here we go into our Photos folder and can browse for and preview the pictures that reside on the server. 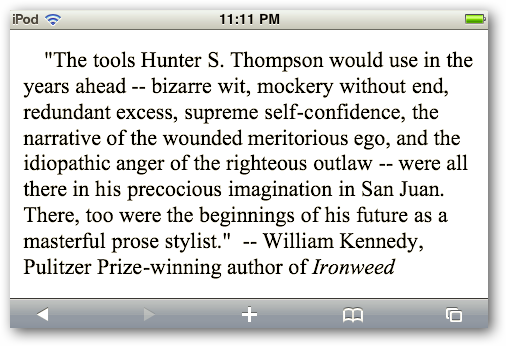 With it in iBooks it makes for a nicer viewing experience. 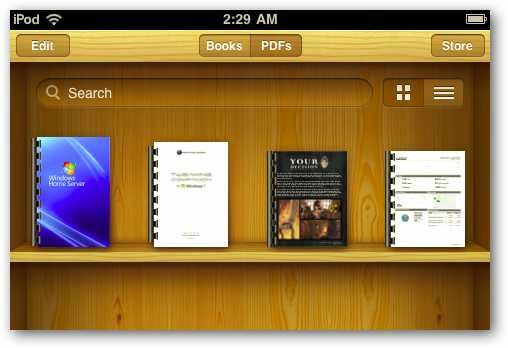 You can also save PDFs to your iBook library. Select the file you want, and click the Download arrow. Here we have some PDFs we downloaded from WHS and stored in our Library. We were even able to read MS Word, Excel, and PowerPoint documents, but not edit them. 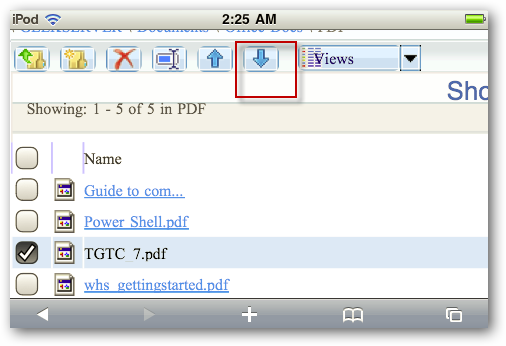 Here is an example of a new .docx Word file. 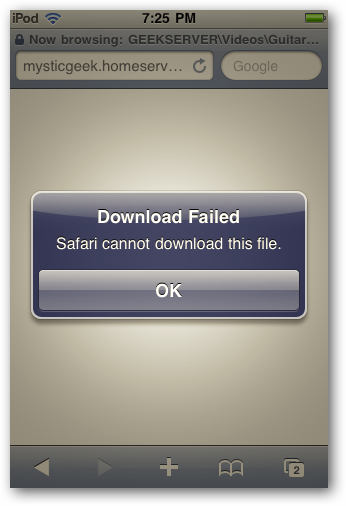 Unfortunately you won’t be able to access media files through the Safari Browser using Remote Access. 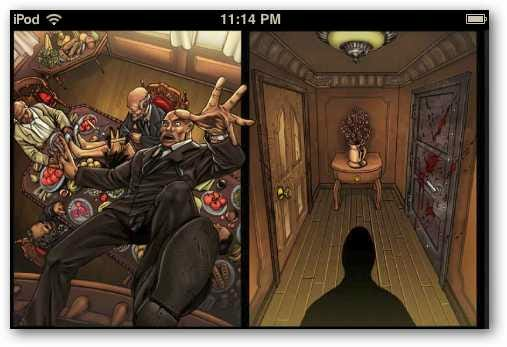 However, we are looking at a few different apps that will allow you to do it that we’ll be covering soon. 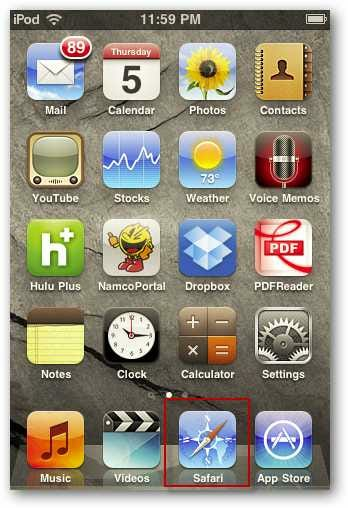 Here we looked at a basic method of accessing your important documents from an iPhone or iPod Touch. You won’t need to jailbreak your device or install any extra apps for basic access to documents. While it may not be the best experience as having full access, in a pinch it will definitely work. We’ll be taking a look at other portable devices and apps in future articles that will allow full access to your home server and the ability to stream media content.